H & M received the prestigious task of creating the Swedish Olympic collection. For the first time H & M has also designed the contest garment for a selected number of sports at the summer games. Parts of the Olympic collection will also be sold to consumers – through a dedicated Olympic Store. The collection includes garments for the opening and closing ceremonies, award ceremonies and a complete wardrobe that the active can use during their workouts and in the Olympic village. Recently the football teams have protested against not getting to use their regular match clothes during the Olympics and has been threatened with being sent home if they do not. Several active, however, has participated in the production of clothing. “As a sports ambassador for H & M, I have been through and tested and provided feedback on the sports collections. For me it’s fun to work out in the stylish and functional sportswear of high quality, ” said swimmer Sarah Sjöström. Even canoeist Petter Menning pronounce that he is satisfied with the results. 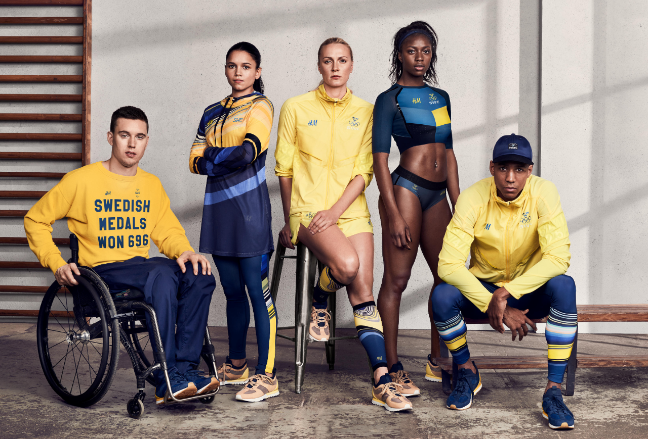 “Through close cooperation with our Swedish athletes, we have produced clothes that they will wear during the opening ceremony as well as the awards, leisure and exercise. We are very happy that this year we have also developed competition garments for numerous sports. The result is a functional Olympic collection with high performance and fashion with many garments made from sustainable materials like recycled polyester, “says Pernilla Wohlfahrt head designer and creative director at H & M.
The day before the opening ceremony, parts of the Olympic collection, which includes the same training and competition clothing they athletes use in Rio de Janeiro, both for women, children and men, as well as accessories like headbands, gym bags and umbrellas. H & M Sweden is therefore opening a pop-up store on Drottninggatan in Stockholm, completely dedicated to H & M Sports and Olympics. In the store, customers will be able to shop Olympic collection as well as other sports range. A portion of the earnings from the sale of the collection goes to the Swedish Olympic Comittee’s top and talent programs.